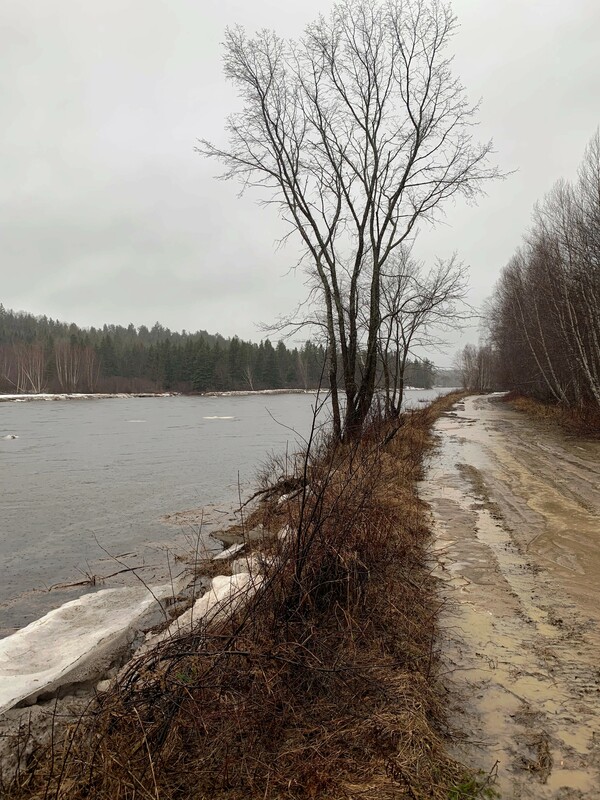 DATE OF THIS MIRAMICHI ATLANTIC SALMON REPORT IS: April 21, 2019. I should have been in my truck and on my way to Blackville now, but “it ain’t happening.” Since Friday the Miramichi and Cains valleys have had roughly two inches of rain and very warm temperatures. The Miramichi in Blackville is up to 6.5 meters and is rising rapidly. This will mean at least minor flooding in many areas. I can see from the web cam at Bullocks in Boiestown that the river is creeping into the woods. Showers and rain are forecast right through next Saturday. That is except for Thursday – which is snow. The possibility of up to 100 mm of rain didn’t happen, and with only showers forecast for the next two days a total disaster will likely be averted – thank god. None-the-less I would think it unlikely that fishing will be very good this coming week, and that means almost two weeks lost to adverse conditions. One brave friend did drive into Shinnickburn and sent me this picture of the Cains. This was from the 20th, and he forecast that the river is now over the road. Stay tuned. There is no temperature gauge in the river yet, but the water will be just a very few degrees above freezing. Recent rains have brought the water to 6.5 meters and rising. Doubtless it has quite a bit more to go. Examples of some large Waddingtons heavily dressed for spring salmon fishing. I’ve found the orange one particularly effective, and seldom use anything else during the early part of spring fishing. 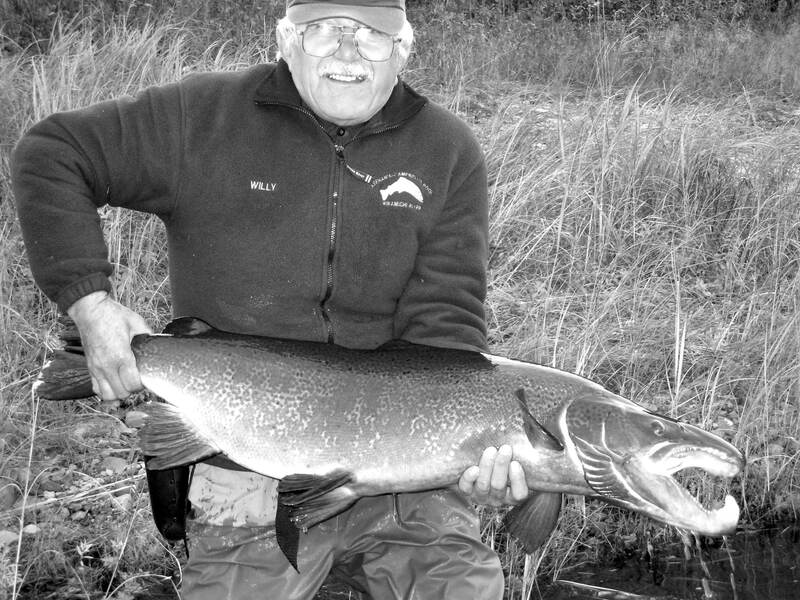 This is definitely the time for big streamers and sink tip lines or the traditional Miramichi full sinking lines. 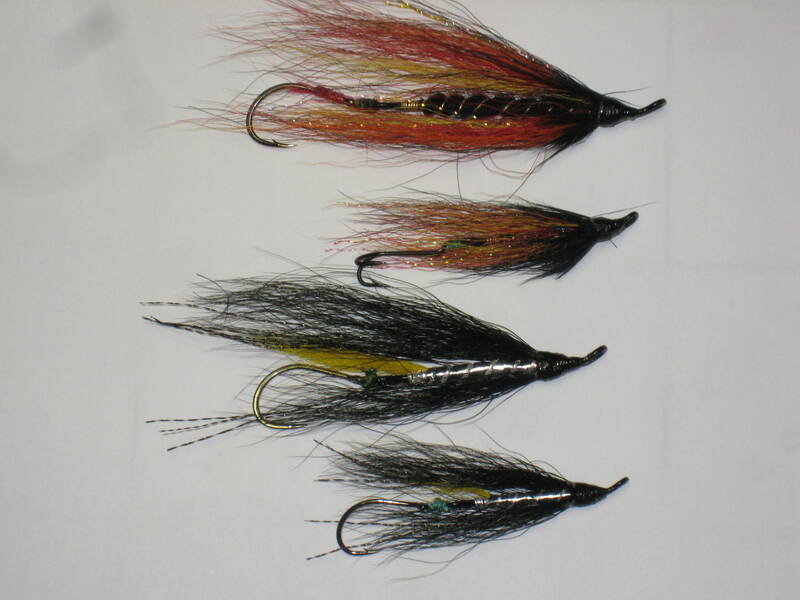 Personally I like large flies for spring salmon, but I don’t want to hook them on extremely large hooks that will make a big wound. I tie most of my spring flies these days on Waddington shanks which allow for a long fly with a relatively small but stout hook at the end. The smaller orange fly is actually tied for fall fishing with a small double .